For Mallory, as for all of his generation, death was but ‘a frail barrier that men crossed, smiling and gallant, every day’. As climbers they accepted a degree of risk unimaginable before the war. What mattered now was how one lived, and the moments of being alive. While the quest for Mount Everest may have begun as a grand imperial gesture, it ended as a mission of revival for a country and a lost generation bled white by war. 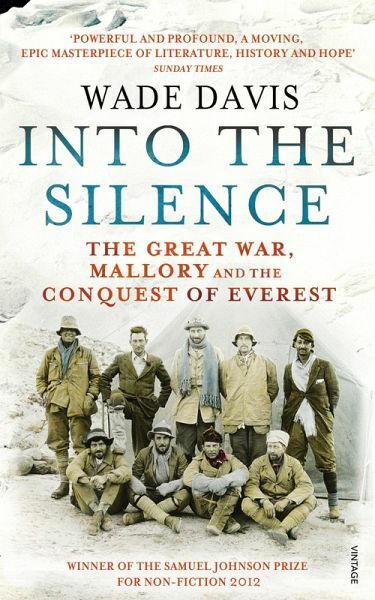 In a monumental work of history and adventure, Davis asks not whether George Mallory was the first to reach the summit of Everest, but rather why he kept climbing on that fateful day. An Explorer-in-Residence at the National Geographic Society, Wade Davis holds degrees in anthropology and biology and received his Ph.D. in ethnobotany, all from Harvard University. Davis is the author of 15 books including The Serpent and the Rainbow, One River, and The Wayfinders. His many film credits include Light at the Edge of the World, an eight-hour documentary series produced for the National Geographic Channel. In 2009 he received the Gold Medal from the Royal Canadian Geographical Society for his contributions to anthropology and conservation, and he is the 2011 recipient of the Explorers Medal, the highest award of the Explorers' Club, and the 2012 David Fairchild Medal for Plant Exploration, the most prestigious prize for botanical exploration. "I was enthralled by Wade Davis’s Into the Silence, an account of three failed Everest expeditions leading up to the death of Mallory in 1924, which brilliantly places those feats of endurance in the context of British imperialism and the psychological aftermath of the First World War"